Wrangler YJ Bumper and Tire Carrier. This RT Off-Road rear bumper and tire carrier was engineered for severe use on a trail rig as well as standard operation on a daily driver. The 3/16” wall construction will protect the vehicles body while the textured black powder coat will keep it looking good for years. 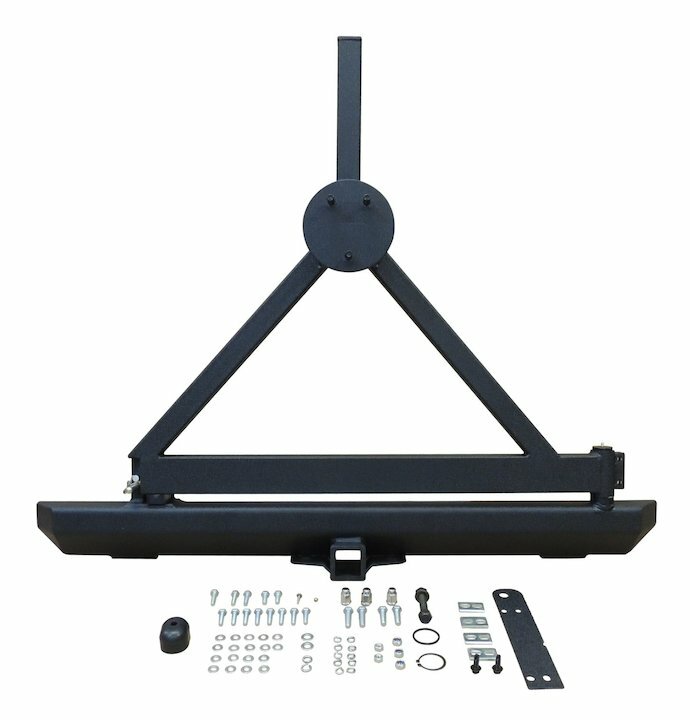 The tire carrier assembly accepts oversized wheels and tires that would destroy the factory tailgate mount. The bumper’s angled profile increases your departure angle without sacrificing overall strength. With this bumper we also recommend also purchasing RT Off-Road’s RT33009 (2” receiver recovery kit) to allow the bumper to be used as a recovery point. Box #1 - 8.75" x 13.75" x 56" 61.5 lbs. Box #2 - 8.75" x 25.75" x 44"